I walked up Crown St, Surry Hills last weekend to meet a collective of writers and alcoholics at the Gaslight Inn. They were from Sink Magazine and had been on a six-hour pub crawl that I was about to step in. 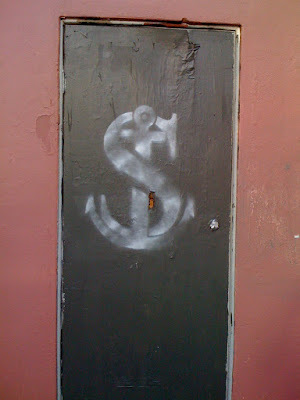 On the way I noticed Sink’s logo painted on this obscure door at the corner of Crown St and Fitzroy Pl. Maybe the party was behind that door. But, um, i’ll never know because no one was even at the Gaslight when i got there. Awful sorry, was trapped between two security doors at a tattoo parlour on Oxford street being questioned by police while Simon was dealing with his own lonely demons. Still looking forward to a drink. Let us know if you fancy some beer and banter in the new year. Hi Aunty. Would like some beer/banter. Thanks for letting me know how much fun you had haha. Merry xmas to you and the sinkers.